Five Finger Tees sent over this awesome T.A.R.D.I.S T-shirt, which I ordered and had delivered within the week, nice and timely and of great quality just in time to tell you about it ahead of our Holiday Gift Guide! This is a nice, clean, soft and well made tee, with a Dr Who design on it, but there are hundreds of other geeky and clever designs over at the website that there is something for everyone! 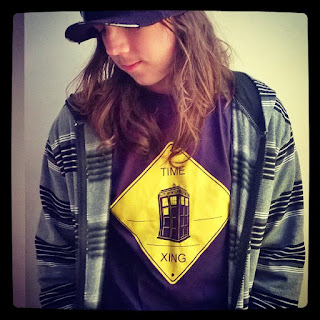 My son, the Dr Who fan (aren't we all, really? ), LOVES the t-shirt and when he loves something he definitely lets me know - he's 19 and so when he doesn't want to wear it, he won't put it on, but here he is, enjoying the new T-shirt in all its glory! Add one to your gift list, this year, I am sure there is someone you know that would LOVE a particular design on their shirt that you might not be able to find elsewhere, so why not take a look and see what you discover! You can find Five Finger Tees at their website or on Twitter and Facebook, respectively! Follow #MGBHGG on Twitter for this years Holiday Gift Guide! Disclaimer: I was given this tee for review and all opinions are my own, honest and unbiased opinions and your views may differ. Thank you!